Those pencils are SICK! I love the composition...what was this piece used for? Why is Raphael always in the front up close like that? It's like he's claimed that spot or something and he's gonna beat someone up if they take it. What was your "cyber-inking" process? I recall you saying it meant you had to pencil in more detail. I'm guessing back in '91, the scanner was black and white or grayscale? I remember tinkering with mono scanners back around that time, and I know with a little tinkering you could take pencil images and make nice clean black and white scans. Was it as simple as scanning it in and fiddling with the threshold to get a the best result, and then a little touch up here and there? Or was there more to it? Even the best of inkers can rarely match the beauty and life of the original pencils, but, man... this one REALLY got destroyed. Wow. But the pencil drawing is simply gorgeous! Beautiful piece! -->> ..it's another awesome lead too .. in that this 'd be a killer cover to an art book or print. YOUR Effin' PIN-up in TALES IS ALSO ' SICK !! M.F. .. you drew did dam good on one of my fave characters of all time..
i need to fins you so you can sign my book !! !! but I'm absolutely honored by the response I've gotten from everyone about the Pin-up, knowing you have the approval of the die-hard fans is just honestly beyond flattering. Tokka, feel free to PM me on the drome if you'd like, I'd be more than happy to sign a copy for you. Sorry for the interruption, we now return to your regularly scheduled programming...This seriously awesome group shot, that really really needs to become a cover for something soon, so I can go buy it. Agreed. This Ink reminds me of when I used to use those ink pens in high school. The tips ALWAYS split in half, the ink came out too much with even the lightest of touches, or it came out too little. Man, I haven't thought of that in years untill I saw the inked version. The Pencil version, however, is AWESOME! I love this piece. The way Raph is right up front, eager to get to whatever is beyond the frame...the persona's of the boys are clear here. Its wonderful. 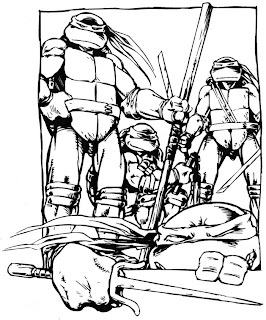 AHHh I love how Raph's positioned, that's cool. He's gotta be the front man, tough guys can be fun too. Those pencils are SICK! I love the composition...what was this piece used for?" What was your "cyber-inking" process? I recall you saying it meant you had to pencil in more detail." The essential part of my "cyberinking" process was converting a raster graphic (the scan of the penciled atwork) into a vector graphic. While the lines in raster graphics are basically bult up of "blocks" (or pixels), which you can see when you zoom in on them, vector graphics rely on mathematical descriptions of those lines. The result is that vector graphics can be scaled up or down without losing their sharpness, whereas raster graphics quickly lose that sharpness when blown up and degrade into a blocky, pixelated look. Also, in the conversion from raster to vector -- originally done using Adobe Streamline, though later I found a better program called Silhouette -- some amout of "approximation" is done by the software when it turns a scanned, rasterized line into a vector graphic line, resulting (usually) in what I consider to be a fairly good imitation of an inked line. My process was to start with a pencil drawing, which I would deliberately draw more cleanly and clearly than I would ordinarily do if I were going to ink it with traditional methods. I would scan this drawing at somewhere between 150 and 300 dpi, and use Photoshop to clean it up if necessary, adjusting the lightness and contrast to get it fairly crisp-looking. At this point, I would open that file in Streamline (later Silhouette), and convert it into a vector graphic file. This I would then open in Adobe Illustrator, which would allow me to see exactly how the conversion process had transformed the image, and also allow me to tweak it by deleting, adding or moving the appropriate "control points". "I'm guessing back in '91, the scanner was black and white or grayscale?" As for the scanner thing, come to think of it, we were colour by then at least in the office. I think in the first print room I worked at it wasn't so much a scanner, but the Laser printer was connected to the Macs. Certainly not affordable to the man on the street, but that's the advantage of earning the big bucks. That'd be a wicked poster of t-shirt design. 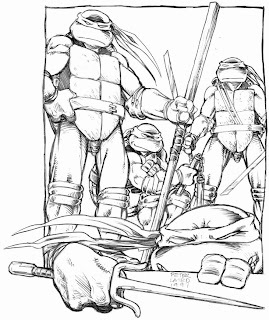 -->> Roth, Pete is one of the creators of the TMNT.